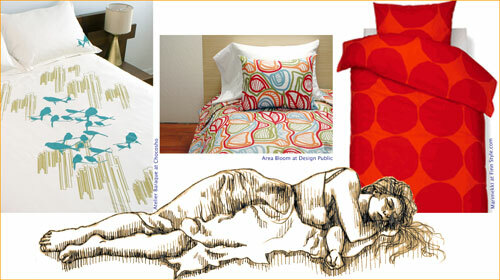 These graphic duvets are so bright and bold, you might end up closing your eyes just to give them a rest. Maybe you could hang them above your desk? I added a little drawing of a sleeping maiden … zzzzz. i love this sketch of the sleeping maiden…beautiful! Thank you. It was fun. I want the bed spread with the birdies on it!